Innovation at your fingertips: In the Bremen Ambient Assisted Living Lab new intelligent technologies are being tested in a realistic environment, and development work is made transparent to the public. The BAALL is a fully furnished apartment, which adapts to the needs of the inhabitants. This includes e.g. smart appliances like a sink or toilet adjusting automatically to a person's height, an intelligent wardrobe suggesting outfits, an intelligent wheelchair and an intelligent walker, which are fitted with technical equipment to compensate declining physical and cognitive capabilities of elderly persons. For research and development the BAALL, opened in 2009, is the ideal environment: here, researchers from DFKI together with scientists from the University of Bremen and the Collaborative Research Center SFB/TR8 Spatial Cognition of the German Research Foundation are developing mobile assistance and support systems for seniors in spe. They are testing them with regards to their everyday usability, and are continuously improving them. This includes inter alia the development of an intelligent wheelchair and an intelligent walker. Both are equipped with sensors and actors allowing them to support the user with safe driving (braking, automatic collision avoidance or evasion) and navigation to known locations. 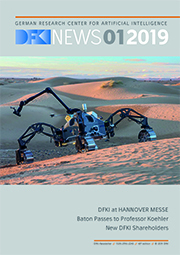 BAALL has been developed under the lead of Prof. Dr. Bernd Krieg-Brückner in cooperation with the University of Bremen in the EU project SHARE-it and the SFB/TR8 Spatial Cognition of the Deutsche Forschungsgemeinschaft (DFG). Since February 2014 BAALL is headed by Dr.-Ing. Serge Autexier.